The Dodd-Frank Wall Street Reform and Consumer Protection Act (Dodd-Frank) significantly expanded the regulatory authority of the Federal Reserve Board of Governors (the Board) over banking institutions, financial firms, and their subsidiaries. Dodd-Frank enhanced the Board’s authority over bank holding companies (BHCs), foreign banks, and subsidiaries of these entities. Dodd-Frank gave the Board new authority over several types of institutions. The Board now has direct or back-up authority over certain financial market utilities (FMUs) and payment, clearing, and settlement institutions designated as systemically important by the Financial Stability Oversight Council (FSOC), an entity created by Dodd-Frank. It also now has authority over nonbank firms “predominantly engaged in financial activities” that are designated as systemically important financial institutions (SIFIs) by the FSOC, including subsidiaries of these firms. Authority to regulate thrift holding companies, supervised securities holding companies, and the subsidiaries of these entities was also transferred to the Board. Dodd-Frank removed some of the Board’s regulatory authority, primarily its supervisory authority over consumer credit products such as mortgages, car loans, credit/debit cards, etc. This authority was transferred to the newly created Bureau of Consumer Financial Protection (CFPB). Dodd-Frank left unchanged the Board’s regulatory authority over state-chartered member banks, foreign operations of US banking organizations, and Edge Act and agreement corporations. The Board’s mandates are overlaid with a new responsibility for the stability of the US financial system. 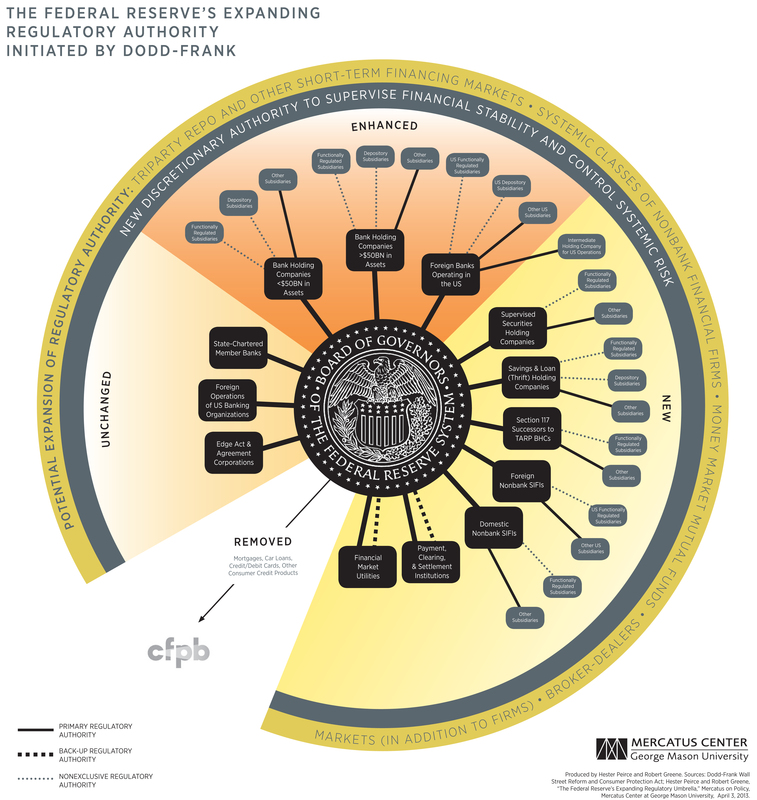 The chart above depicts the growth of the Board’s regulatory powers. Below is an overview of the main ways in which Dodd-Frank augments the Board’s regulatory authority. Expands the Board’s examination capacities over, and requires that BHCs serve as a source of strength for, depository subsidiaries. Broadens the Board’s ability to write rules for, impose reporting obligations on, examine the activities and financial health of, and bring enforcement actions against subsidiaries, including functionally regulated subsidiaries (those already regulated by the SEC or the Commodity Futures Trading Commission (CFTC) and state-regulated entities). Requires the Board to examine certain activities of subsidiaries that do not have another financial regulator. Subjects BHCs with $50 billion or more in assets to “more stringent” prudential standards including liquidity and risk-based capital requirements, leverage limits, risk-management requirements, resolution plan and credit exposure report requirements, and limits on credit exposure; grants Board authority to impose other heightened prudential standards, including contingent capital requirements, enhanced public disclosures, and short-term debt limits. Broadens the Board’s authority to impose prudential regulations, such as liquidity and risk-based capital requirements, leverage limits, and risk-management requirements on large foreign banks operating in the US. As part of implementing this authority, the Board proposed to require large foreign banks with a significant US presence to form intermediate holding companies to consolidate US operations for easier Board oversight. Expands the Board’s discretionary authority with a nebulous mandate to consider risk to the financial system in different contexts, such as examinations, merger and acquisition approvals, and divestitures. Provides the Board consolidated supervision authority over companies that own or control one or more SEC-registered brokers or dealers. Authority reaches subsidiaries, including functionally regulated subsidiaries. Ensures the Board retains regulatory authority over BHCs with more than $50 billion in assets as of January 1, 2010, that participated in the Capital Purchase Program under TARP. Section 117 of Dodd-Frank directs the Board to treat these firms like designated nonbank SIFIs if they cease to be BHCs. Shifts regulatory authority over these companies from now defunct Office of Thrift Supervision to the Board. Requires that thrift holding companies serve as a source of strength for depository subsidiaries. Grants the Board ability to write rules for, impose reporting obligations on, examine the activities and financial health of, and bring enforcement actions against thrift holding company subsidiaries, including functionally regulated subsidiaries. Requires the Board to examine certain activities of otherwise unregulated subsidiaries. Subjects nonbank companies “predominantly engaged in financial activities” and designated as SIFIs by the FSOC because they could pose “a threat to the financial stability of the United States” to prudential standards, including liquidity and risk-based capital requirements, leverage limits, risk-management requirements, resolution plan and credit exposure report requirements, and limits on credit exposure. Gives the Board the ability to write rules for, impose reporting obligations on, examine the activities and financial health of, and bring enforcement actions against subsidiaries, including functionally regulated subsidiaries. Subjects designated FMUs and financial institutions engaging in payment, clearing, and settlement activities determined by the FSOC to be or likely to become “systemically important” to enhanced regulatory standards—for example, rules that govern risk-management policies, margin and collateral requirements, and counterparty default policies and procedures. The Board has direct authority or—in the case of FMUs and financial institutions regulated by the SEC or CFTC—back-up authority. Transfers authority to regulate these products to the CFPB. The Bureau is officially independent from the Board, but it is technically housed within and funded by the Federal Reserve System. The Board continues to supervise and regulate state-chartered member banks of the Federal Reserve System. Dodd-Frank did not alter the Board’s supervisory authority over Edge Act and agreement corporations, which are chartered by the Board and states respectively to engage in international banking transactions. Dodd-Frank also did not affect the Board’s oversight of domestic banks’ foreign operations. The Federal Reserve’s performance as a regulator in the years leading up to the 2007–08 crisis earned it widespread criticism. Dodd-Frank, instead of responding to these criticisms, greatly enhanced the Fed’s regulatory authority. Recent comments by Federal Reserve officials indicate an institutional eagerness to expand this authority further into all corners of the financial markets, even those already overseen by other regulators. Federal Reserve System officials have highlighted the Federal Reserve’s efforts with respect to the triparty repurchase agreement (“repo”) markets and have expressed a desire for additional authority over these markets. One potential idea includes creating a liquidity facility with a government backstop and attendant prudential regulation by the Board. A second phase of triparty reform is now underway, with the Federal Reserve using its supervisory authority to press for further action not only by the clearing banks, who of course manage the settlement process, but also by the dealer affiliates of bank holding companies, who are the clearing banks’ largest customers for triparty transactions. But this approach alone will not suffice. All regulators and supervisors with responsibility for overseeing the various entities active in the triparty market will need to work together to ensure that critical enhancements to risk management and settlement processes are implemented uniformly and robustly across the entire market, and to encourage the development of mechanisms for orderly liquidation of collateral, so as to prevent a fire sale of assets in the event that any major triparty market participant faces distress. One could imagine a mechanism that was funded by tri-party repo market participants and potentially backstopped by the central bank. . . . Because no single market participant has a strong incentive to develop such a mechanism, however, sustained regulatory pressure may be required to reach such a solution. Other short-term securities financing transactions, besides triparty repo transactions, have been targeted by Federal Reserve officials for further regulation. A major source of unaddressed risk emanates from the large volume of short-term securities financing transactions (SFTs)—repos, reverse repos, securities borrowing and lending transactions, and margin loans--engaged in by broker-dealers, money market funds, hedge funds, and other shadow banks. . . . SFTs, particularly large matched books of SFTs, create sizable macroprudential risks, including large negative externalities from dealer defaults and from asset fire sales. The existing bank and broker-dealer regulatory regimes have not been designed to materially mitigate these systemic risks. Governor Daniel Tarullo views “systemic classes” of nonbank financial firms as a source of potential threats to financial stability and has expressed the belief that additional regulatory oversight is needed. The threats to financial stability from the shadow banking system do not reside solely in a few individual nonbank financial firms with large systemic footprints. Significant threats to financial stability emanate from systemic classes of nonbank financial firms and from vulnerabilities intrinsic to short-term wholesale funding markets. . . . we need to increase the transparency of shadow banking markets so that authorities can monitor for signs of excessive leverage and unstable maturity transformation outside regulated banks. Since the financial crisis, the ability of the Federal Reserve and other regulators to track the types of transactions that are core to shadow banking activities has improved markedly. But there remain several areas, notably involving transactions organized around an exchange of cash and securities, where gaps still exist. Many Federal Reserve officials have called for further reform of money market funds.26 Eric Rosengren, president of the Federal Reserve Bank of Boston, has been one of the most outspoken. By emphasizing financial stability—now part of the Board’s mandate—Rosengren suggests that money market funds ought to be within the Board’s regulatory sphere. Federal Reserve Bank of New York President William Dudley raised the possibility of extending the Federal Reserve’s lender of last resort function to nonbanks with attendant prudential regulation. Governor Daniel Tarullo has hinted at a new regulatory paradigm in which markets, in addition to firms, are regulated by the Board. The pursuit of new regulatory power is a troubling manifestation of the Board’s embrace of macroprudential regulation in which every aspect of the financial system is monitored and controlled by regulators. This approach not only displaces market discipline, it also displaces other regulators. In the process, it may undermine financial stability by ensuring that regulatory mistakes by the Board reverberate through the entire financial system. Dodd-Frank §§ 604(b) and 616(d). Board of Governors of the Federal Reserve System, 77 Fed. Reg. 76628, 76637 (Dec. 28, 2012) (proposing to “apply a structural enhanced standard under which foreign banking organizations with total consolidated assets of $50 billion or more and combined U.S. assets of $10 billion or more (excluding U.S. branch and agency assets and section 2(h)(2) companies) would be required to form a U.S. intermediate holding company”). See, for example, Dodd-Frank §§ 121, 163, 173(b), and 604. Dodd-Frank §§ 617 and 618. Dodd-Frank § 618. Dodd-Frank mandates some deference to other regulators. See, for example, ibid. at (c)(2)(B). Board of Governors of the Federal Reserve System, Supervised Securities Holding Company Registration, 77 Fed. Reg. 32881, 32882, (June 4, 2012). Dodd-Frank §§ 113 and 165. Dodd-Frank §§ 113 and 162(b). Dodd-Frank §§ 804, 805, 807, and 808. Dodd-Frank §§ 805, 807, and 808. See, for example, Dodd-Frank §§ 1017, and 1012(c). Governor Daniel Tarullo, Speech at the Federal Reserve Bank of San Francisco Conference on Challenges in Global Finance (June 12, 2012), available at http://www.federalreserve.gov/newsevents/speech/tarullo20120612a.htm. William Dudley, President, Federal Reserve Bank of New York, Speech at New York Bankers Association’s 2013 Annual Meeting and Economic Forum (Feb. 1, 2013), available at http://www.newyorkfed.org/newsevents/speeches/2013/dud130201.html. Vice-Chairman Janet Yellen, Speech at the International Monetary Conference (June 2, 2013), available at http://www.federalreserve.gov/newsevents/speech/yellen20130602a.htm. Governor Daniel Tarullo, Testimony Before the Senate Committee on Banking, Housing, and Urban Affairs (July 11, 2013), available at http://www.federalreserve.gov/newsevents/testimony/tarullo20130711a.htm. See, for example, Letter from 12 Federal Reserve Bank Presidents to Elizabeth M. Murphy, Secretary, Securities and Exchange Commission (Sept. 12, 2013), available at http://bostonfed.org/news/press/2013/pr091213-letter.pdf. Eric S. Rosengren, President & CEO, Federal Reserve Bank of Boston, Speech at Conference on Stable Funding (Sept. 27, 2013), available at http://www.bostonfed.org/news/speeches/rosengren/2013/092713/092713text.pdf. William Dudley, President, Federal Reserve Bank of New York, Speech at New York Bankers Association’s 2013 Annual Meeting and Economic Forum (Feb. 1, 2013) (footnote omitted), available at http://www.newyorkfed.org/newsevents/speeches/2013/dud130201.html. Governor Daniel Tarullo, Speech at the Yale Law School Conference on Challenges in Global Financial Services (Sept. 20, 2013), available at http://www.federalreserve.gov/newsevents/speech/tarullo20130920a.htm.